A few weeks ago I stumbled up a little treasure trove here in Los Angeles. Works of art worthy of a museum. City views. A rooftop pool filled with warm salt water like the last Tsar had at his palace in Tsarskoye Selo. A garden where butterflies and hummingbirds hover. Moroccan tiles shine on the floors, and unique antique furnishings are abundant. There's even a samovar behind the bar. It's like stepping into a different country. Like leaving Los Angeles, without ever setting foot at the airport. What manner of place is this? Well, it's a unique boutique hotel hidden away on a quiet residential street in West Hollywood. This is the world of the Petit Ermitage. Like it's namesake, the museum The Hermitage in Russia, the hotel contains a fascinating collection of art and furnishings. The hotel is operated by the brothers Ashkenazy. The Ashkenazy family has a rich history in managing luxurious hotels. But unlike some of the other hotels the family has run, the Petit Ermitage, offers the luxury without the five star price. The average daily rate at the hotel is $185.00 (US) for a demi suite. Lower rates are available depending on availability for $150.00 (US.) In contrast, rooms at the nearby Chateau Marmont start at $395.00 (US.) That's quite a differential. Unfortunately, Los Angeles is not a city known for affordable hotel stays. Although it's budget friendly, the Petit Ermitage is not a budget experience. You would not know this is a hotel from passing by it on the street since the facade discreetly blends into the neighborhood. It looks like an apartment building, which at one time it was. Inside the hotel is luxurious. There are Ertés hanging on the walls that most of us have only seen in vintage collections of Harper's Bazaar magazine covers. The Ertés are only a part of the hotel's extensive and beautiful art collection. Art decorates every part of the hotel. The day I stopped by the owner was overseeing the painting of murals in one of the bathrooms in the hotel. Like a luxury European hotel, a private butler is on staff and available to guests who upgrade to deluxe suits if they need a little extra pampering. Despite the services of the butler, most guests seem content to enjoy sunning themselves at the pool or enjoying a quiet lunch/dinner in the garden. I had the occasion to try the food at the hotel and it was delicious and very European inspired. Likewise, the hotel's coffee is a strong European blend served from the press pot. For me, as for most travelers, excellent food and delicious coffee are key criteria in choosing a hotel. A good cup of coffee sets the tone for the whole day, and I hate it when I have to leave the hotel and go outside to get my coffee. The hotel manager, Stefan Ashkenazy notes that "our mission is to be transformational." Throughout the hotel, there are many hand selected decorations, and carefully placed objects d'art on display. There's even an old gramophone in the lobby that still plays. Everything was carefully orchestrated by Mr. Ashkenazy (the hotel's decorator) to give the hotel a distinctive look and feel. There's everything from Indonesian wattle fencing, to a shabby chic table salvaged from the roadside on Pacific Coast Highway. And it works. The combination of the art, the views, the food, and the pool all conspire to deliver a unique experience to the visitor. Mr. Askenazy notes that many local Los Angeles residents check into the hotel as an escape just as visitors from New York and Europe do. Some local residents have even been invited to enjoy the hotel as a private club. [note to self, try to get invited. : ) ] As club members, guests can come and enjoy the rooftop pool, the bar and other amenities without checking in. 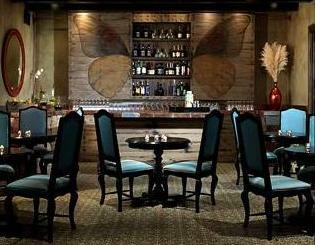 Pictured: The Butterfly bar at the Petit Ermitage Hotel, offers Russian inspired cocktails. You only have to see this bar, to understand why people might want to join this club. The hand painted Butterfly bar on the top floor is a relaxing place to enjoy a cocktail. One of the hotel's signature cocktails is the Babochka . Mention this article and you will receive a complimentary "Babochka" when you are booked as a guest. Babochka means butterfly in Russian. This drink is a mixture of Grey Goose Pear Vodka, Fresh Lemon, Lime, Cucumber and Mint that offers soothing comfort. Just what is needed after a long day out shopping for bargains! Beyond the cocktails and the coffee, the hotel offers a shuttle bus to The Grove mall for some premier shopping. Many hotel guests enjoy checking in after Nov. 15th to do their Holiday shopping in the temperate climate of Los Angeles at the nearby shops. 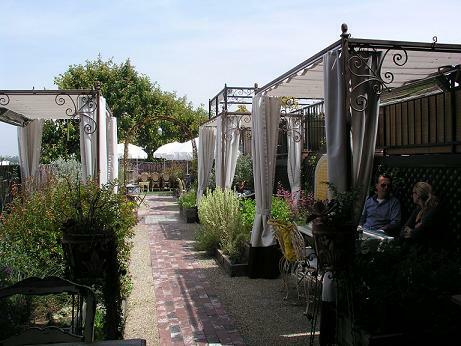 Whether you're local to Los Angeles, or visiting, the Petite Ermitage Hotel has much to offer as both a comfortable hotel, and an artistic experience. Locals may want to explore it as a place to host a small private event (bridal shower, birthday) or enjoy a staycation. For business travelers, the hotel is equipped with wireless Internet and business services. As I learned, once you discover this little hideaway, you will inevitably wish to return.